Has some good stories, one of them very interesting. The one that ends: "To do what?" This was uneven, as is typical for such collections. Robinson admits one of the stories is an early stinker, and his most popular stories didn't make the cut because they were reprinted elsewhere. But, there is still some good stuff. I like Spider. I even like him personally, having sat and talked with him at length at a convention several years back. Yes, I liked this book as well and I've re-read it several times. 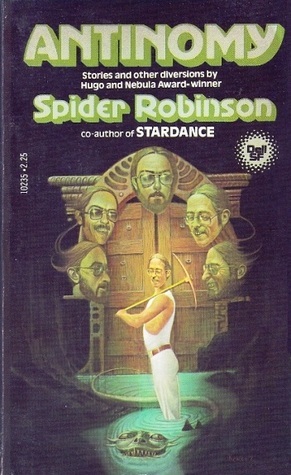 Spider Robinson Larry Kresek - Spider Robinson is an American-born Canadian Hugo and Nebula award winning science fiction author. He was born in the USA, but chose to live in Canada, and gained citizenship in his adopted country in 2002. Robinson's writing career began in 1972 with a sale to Analog Science Fiction magazine of a story entitled, The Guy With The Eyes. His writing proved popular, and his first novel saw print in 1976, Telempath. Since then he has averaged a novel (or collection) a year. His most well known stories are the Callahan saloon series.